After gathering some great recipes the last couple of fattening days. I thought I would provide a way to write them all down nice and neat. I already posted the recipe cards, but this time they are better. THIS TIME YOU CAN TYPE YOUR RECIPE IN! The same is true for the dividers-you get to write in whatever you like! Then you can organize things you're way-with as many as you need. Fun fun. They could also be fun put in a recipe box (modge podge an old one?) and given as a gift with your favorite recipes. Or just send a favorite Christmas recipe with the homemade goods as neighbor gifts. The possibilities. Anywhoo. The only downer to making them editable is that I can't just link them up-scribd isn't a fan of editable fields apparently. Oh, and the other downer is you can't save the edits. That means you have to type it in and print it out immediately because it won't save what you typed. Alas. So here are you're options: email me at yellowmum (at) gmail (dot) com and let me know what you want-the cards, the dividers, both . . . your Christmas wish list. (joking). I'll send them as soon as I can. 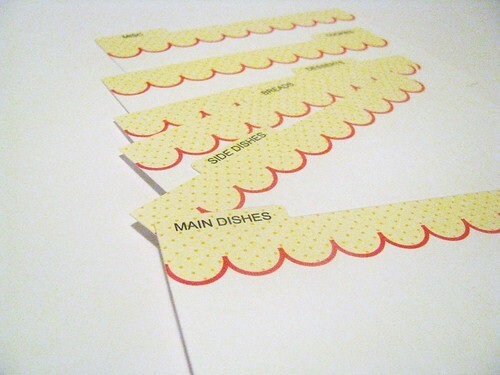 Or, don't worry about the neatly typed look and download the empty dividers here and recipe cards here and write them in by hand. Sorry for the weirdo freebie. Email me so you can Enjoy! I really like those. They are super cute. I will print and add labels myself. Thanks for another wonderful printable. Hooray!! 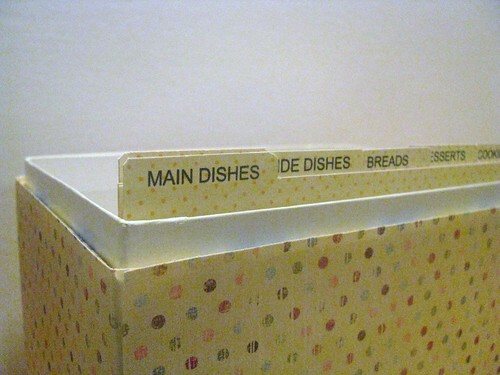 I just discovered that you made these dividers! I asked for them as soon as you made the fab cards so I am super excited to see these. THank you!! I realize I am way later from this free fun, but could you tell me how to find a link etc to find them NOW? They are rather perfect for that sweet handwritten family recipe. Thanks!